It�s your daughter�s wedding and you definitely want to look good and sober. This dress fit the bill perfectly. 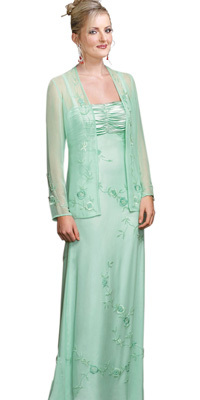 This dress has a beaded floral design with an empire bodice and a bust that is ruched. The sleeves are full in length and that is because of the jacket. Otherwise the dress has spaghetti straps.